Kelly Clarkson had an intrinsic desire to succeed in the music industry with her powerful voice and she eventually got the much-needed boost through the American Idol music talent show in 2002. She is a songwriter, powerful singer, actress, author, and song producer. Clarkson has been nominated for multiple awards including the Grammy and Academy Music Awards. Indeed, despite her rough start, Kelly Clarkson has become a role model to all those struggling on a career path as her story shows there is a light at the end of the tunnel. Kelly Brianne Clarkson was born on 24th Apri, 1982, in Texas, United States. The magnificent song writer is also a singer who has blessed the world with her voice. Her parents, Jeanne Ann Taylor and Stephen Michael Clarkson divorced when she was six years old. After her parent’s separation, the family was torn apart as her older sister, Alyssa, went off to stay with their aunt, while her older brother, Jason, continued to live with their father for a while. She attended Pauline Hughes Middle School before proceeding to attend Burleson High School and graduated in the year 2000. In high school, she sang and performed in different musical concerts such as Annie Get Your Gun and Seven Brides for Seven Brothers. Kelly Clarkson developed a passion for music right from her tender age, she would go to church on Sundays and Wednesdays majorly so that she could watch the choir sing. The day she visited the African-American Church in Fort Worth, she was amazed at the music performance at the church that she was determined to be like the singers. She drew inspiration from the likes of Aretha Franklin, Mariah Carey, and Whitney Houston. Gifted with an amazing voice, it was when Kelly Clarkson was in the 7th grade at Pauline Hughes Middle school that the choir teacher, Cynthia Glenn, after listening to her sing, enjoined her to audition for the school choir. Her singing talents would see her secure three scholarship offers from three different colleges after she graduated from high school, but she turned them down and she preferred to try a career on her own. She did some odd jobs to raise funds and develop demos she could market to record labels but the responses she got were not exactly encouraging and she had to turn down contracts from two record labels – Jive Records and Interscope Records. The relentless musician later traveled to Los Angeles in 2001 to further her career, but while waiting for her music to bloom, she featured in some television series like Sabrina the Teenage Witch and Dharma & Greg. Kelly Clarkson hooked up with musician Gerry Goffin and recorded five tracks, but was still turned down by music companies who deemed her sound “too black”. Almost feeling discouraged, she returned to Burleson where she began to work at Movie Theater and also promoted Red Bull energy drinks while serving as a waitress in a comedy club. In 2002, she auditioned for the inaugural season of a reality television series American Idol: The Search for a Superstar and got selected. Despite the tight competition, Kelly Clarkson made it to the final stage and was announced the winner on September 4, 2002. Her first single, A Moment Like This, was released in the late September of the same year. The following year, she featured in the World Idol where she emerged the runner up with 97 points. Her victory was a catalyst that propelled her to a recording contract with RCA Records, and the dropped her debut album titled Thankful in 2003. She would go on to drop six more albums; Breakaway (2004), My December (2007), All I Ever Wanted (2009), Stronger (2011), Wrapped In Red (2013) and Piece by Piece (2015). After parting ways with RCA Records, she signed another contract with Atlantic Records in June of 2016 and has so far dropped one album, Meaning of Life, with the label. The album was released on October 27, 2017, and it made it her 8th studio album. She has also starred in a number of films like; From Justin to Kelly (2003), a musical comedy film, Broke (2011) and The Star (2017) while she has appeared in well over 25 television series since her debut appearance in That 80s Show (2002) and Sabrina the Teenage Witch (2002). As a gifted writer, she has exhibited her writing skills in the children’s books she has authored. Her first book titled River Rose and Magical Lullaby was released on October 4, 2017, while it was followed by her second book, River Rose and the Magical Christmas, which was released on October 27, 2017. Her efforts in the entertainment industry have earned her several awards including three Grammy Awards, three MTV Video Music Awards, four American Music Awards and two Academy of Country Music Awards with several other nominations. She made the list of VH1’s 100 Greatest Women in Music where she occupied the 19th position. Kelly Clarkson has a net worth of $28 million which she made from her music career, venturing into film, and television, and also from writing children’s books. Besides all that, she served as a voice coach in the music television competition The Voice. Kelly Clarkson and Brandon Blackstock got married on 13th October 2013 in Tennessee and their union has been blessed with 2 kids; a daughter born on 12th June 2014 named River Rose and a son born on 12th April 2016 named Remington Alexander Blackstock. Aside from these 2 kids that the couple both share, Blackstock also has 2 other kids from his last marriage. Brandon Blackstock’s two children are Savannah Blackstock, born in 2001 and Seth Blackstock who was born on September of 2006. 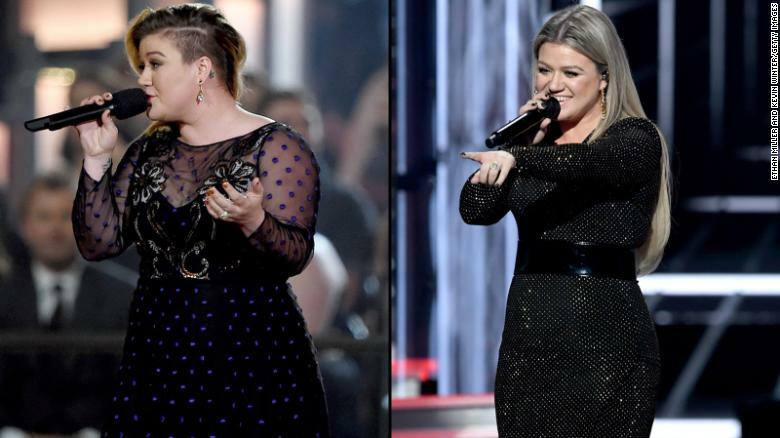 How Did Kelly Clarkson Lose Weight? The Break Away Crooner underwent a weight loss regimen in November 2018 after suffering from an autoimmune disease that took its tow on her health. She employed the services of expert trainers like Nora James who helped her mapped out a great exercise, high powered protein and veggie based diet. This saw her lose over 37 pounds in a fell swoop. Read Also: Carrie Underwood Husband, Body, Age, Height, Son, Is She Divorced? With her beautiful hazel colored eyes and blond hair, the singer stands at an average height of 5 feet 3 inches (1.60 m) with her weight reported as 79 kg (174 lb). Her other body parts are measured as follows; breast size (37 inches), waist size (31 inches), hips (37 inches). Her shoe size of about 7 US (37 Eur).